Chanae Wilson is the Engagement Assistant with the Budget & Tax Center. She joined BTC in January 2017 as a Public Allies Apprentice through the AmeriCorps program. 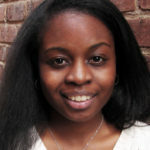 She primarily works on the coordination of community engagement programming and key initiatives under BTC such as the NC Summer Policy Institute. Chanae is currently pursuing a Master of Arts (M.A.) in Liberal Studies with a focus in Social Policy from North Carolina State University. She earned her Bachelors of Arts (B.A) in Psychology at Saint Augustine’s University.